Growth of these organisms is a serious problem in municipal and industrial water systems such as once-through or re- circulating cooling water systems, cooling ponds, intake pipes, ballast water tanks and ship reservoirs that draw water from infested bodies of water. Microbes may cause many problems including pressure loss from fouling of piping and heat exchanger, loss of heat exchanger efficiency due to coating of the heat exchange surfaces, promotion and acceleration of corrosion on metal surfaces, increased down time, or breaks in paper sheets in pulp and paper systems, and deterioration of cooling tower components. This growth can cause severe plugging and damage to the systems they colonize, resulting in system down time and costly cleanings and repairs. As a consequence of the deleterious effects of uncontrolled biological growth and contamination in many industrial processes, different biocides and antimicrobials have been developed to aid in eliminating and controlling biological growth. Biocides and antimicrobials are used to control microbial growth in a number of different aqueous media. Often, one biocide is insufficient to control biological growth in the aqueous media. Biocides may act in combination, i.e. synergistically, to yield better biocidal performance as opposed to the efficacy obtained when each biocide is used separately. The combination of two biocides may yield enhanced efficacy beyond the cumulative or additive effect of the two biocides. This likely reflects a synergistic biocidal effect on some essential component(s) of the cell for survival and sustained growth. A combination of two biocides that are synergistic allows for the addition of lesser amounts of the individual biocides to achieve the desired level of control. A common practice is to alternate feeding two different types of biocide, not allowing the biological growth to become resistant to one or the other. This "shock" treatment is very successful in controlling undesirable biological growth. This has both advantageous environmental and economic impacts. It allows for reduced discharge of potential environmental pollutants and a more cost effective control program for diverse industrial systems. Chlorine is used as an oxidizing biocide to control this biological growth in most industrial cooling towers. Monitoring the ORP (Oxidation Reduction Potential)/redox is very useful in its ability to correlate millivolt readings to sanitization strength of the water. For Chlorine (Cl2) to function properly in the cooling towers it must be present in the oxidizing forms of hypochlorous acid (HOCl) or hypochorite ion (OCl-). The equilibrium between the three species is pH dependent and can be monitored by using oxidation-reduction potential (ORP) electrodes. ORP is a measure of a solutions oxidizing or reducing strength. The chemical way to look at redox processes is that the reductant transfers electrons to the oxidant. Thus, in the reaction, the reductant or reducing agent loses electrons and is oxidized and the oxidant or oxidizing agent gains electrons and is reduced. When electrons are transferred from one species to another in a chemical reaction, the reaction is called an oxidation-reduction reaction; where the oxidizing and reducing agents are called a redox pair. Oxidation and reduction reactions occur together, the electrons generated by a reduction reaction must be acquired by an oxidation reaction. The electron transfer between the two species continues until equilibrium is reached. ORP measure the ratio of the activities of the oxidizing and reducing species in a solution. This indicates the solutions electron activity, i.e., its ability to oxidize or reduce another substance; it does not indicate the concentration of the predominant oxidizing or reducing agent. The speed of response varies with the concentration of the redox system, high concentrations are fast and low concentrations are slow. Below a pH of 1.9, chlorine exists as a diatomic molecule (Cl2) in water. As the pH increases above 1.9, chlorine oxidizes-water to produce HOCl, which further dissociates into OCl above a pH of 7.3. Elemental chlorine is not as effective in killing organisms as HOCl and OCl-. 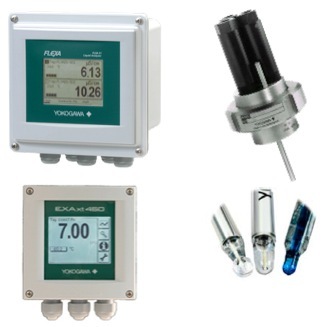 Thus, for optimum effectiveness it is desirable to control the pH of the cooling tower between 7-8 pH. It is also necessary to control the quantity of chlorine in the tower to insure there is enough to control the biological growth, but not so much that it causes corrosion of equipment or creates an excessive load on the water treatment facility. An ORP measurement system can be used to indicate both the quantity and activity of the chlorine in cooling water. Since addition of chlorine increases the oxidizing capability of water, measurement of the ORP provides a useful indicator of the quantity and effectiveness of the chlorine present in the water. However, as we have seen, the pH affects the oxidizing potential of the available chlorine so the ORP will vary with pH changes as well as changes in the chlorine levels. To provide an indication of chlorine level we must compensate the ORP measurement for the effects of varying pH. One way to do this is to replace the Ag/AgCl reference electrode normally used with the ORP electrode with a pH measuring electrode. If the total amount of chlorine in the system remains constant, but the pH changes, there will be a corresponding change in the measured ORP reading. Therefore to us ORP to control chlorine addition we must compensate the measurement for changes in pH. The simplest way to do this is substituting a pH electrode for the reference electrode used with a FLXA21 or PH450G configured for ORP service. This technique is only valid over a narrow range pH 6.5-8.0, and should only be used in simple systems that operate at stable temperatures. (The measurement is not compensated for temperature changes.) It should not be used in situations where there may be a large change in background composition such as wastewater streams or treatment ponds. 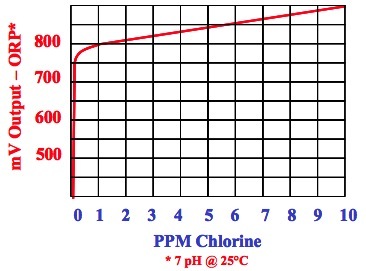 Figure 1 shows typical ppm chlorine levels verses mV reading values. Note: For additional information on these applications, please contact Yokogawa Analytical Department.